Umenie Champagne má bohatú históriu siahajúcu až do stredoveku. Pred 17. storočím, sa vo francúzskom Champagne vyrábajú iba tiché vína - nie šumivé víno ​​známe po celom svete dnes. Katolícka cirkev vlastnila mnoho viníc Champagne a mnísi vyrábali vlastné víno ​​pre použitie vo sviatosti Eucharistie. Francúzski králi boli pomazaný tu v Montagne de Reims Champagne terroir, v regióne sa stále víno ​​podáva počas korunovačných slávností. V 17. storočí sa objavili nové metódy kvasenia. Vinári v Champagne začali vyrábať šumivé víno ​​prvýkrát. Popularita tohto nového druhu vína viedla k celosvetovému rozmachu vo výrobe šumivého vína - ale aj dnes, len šumivé vína vyrobené a fľašované v oblasti Champagne vo Francúzsku sa môžu legálne označovať ako "Champagne". Brut Champagne, vytvorená pre uspokojenie dopytu po suchších šampanských, debutoval v druhej polovici 19. storočia. Classic Brut šampanské vrátane Armand de Brignac Brut Gold, sú vyrobené zo zmesi hrozna z rôznych ročníkov, aby odrážali jedinečný charakter domu. The art of Champagne has a rich history dating back to medieval times. Prior to the 17th century, however, France's Champagne region produced only still wines – not the sparkling wine famous worldwide today. The Catholic Church owned many of Champagne's vineyards and monks produced their own wines for use in the sacrament of Eucharist. France's kings were anointed here in the Montagne de Reims terroir of Champagne, and the region's still wine was served at coronation festivities. In the 17th century, employing new fermentation methods, Champagne's winemakers began to produce sparkling wine for the first time. The popularity of this new type of wine led to a global boom in sparkling wine production - but even today, only sparkling wines produced, bottled, and aged in France's Champagne region can legally lay claim to the term "Champagne." Brut Champagne, created to meet demand for drier Champagnes, debuted in the latter half of the 19th century. Classic Brut Champagnes, including Armand de Brignac Brut Gold, are made from a blend of grapes from different vintage years to achieve the particular character that reflects the unique nature of the house. The quality of its Brut multi-vintage is often the benchmark by which each chateau is measured - this is the wine closest in style to that produced by Champagne's original pioneers. The bold character of Armand de Brignac is born of the same passion and imagination that guided Champagne’s early innovators. 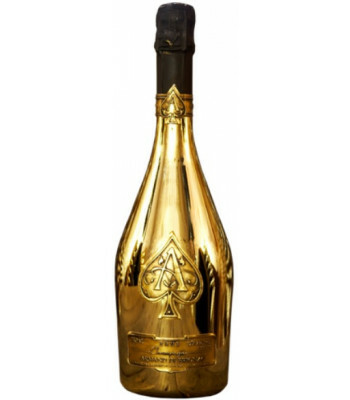 Like them, Armand de Brignac cannot be defined by convention.